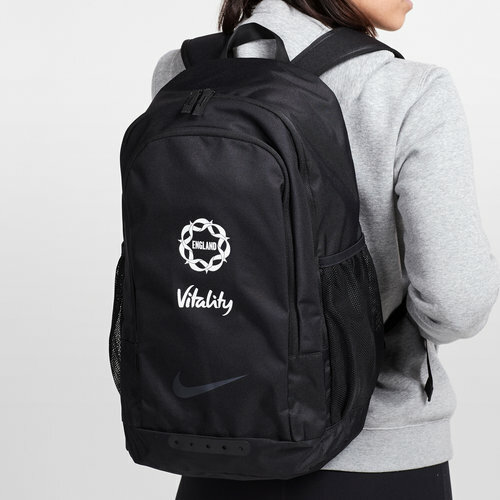 Show your support for the Roses whether it's commuting from work to training or casually out and about with this Nike England 2019 Players Netball Backpack. This Nike backpack features team details as well as practical functionality. This backpack has been crafted in a simple, clean design ready to take your kit to training in. The padded shoulder straps offer comfort whilst the large main compartment allows you to store your belongings safely away with a zip. It has been finished with the Netball England badge and team sponsor - health and life insurance and investment providers, Vitality - just underneath. The Nike logo is just underneath that.